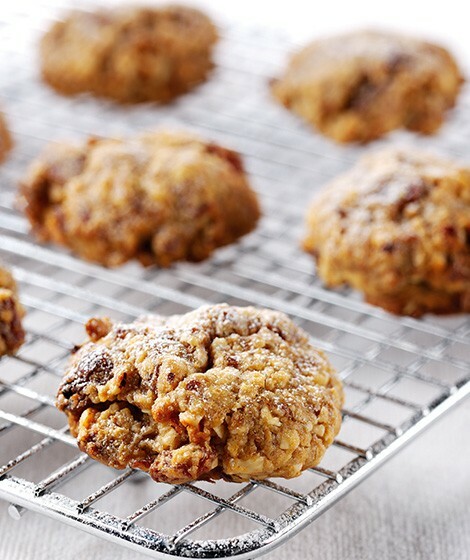 These craggy little cookies are chewy rather than biscuity, so they're like a moist flapjack. Preheat the oven to 200°C gas mark 6. Grease two baking sheets. Put 150g of the sultanas in a small saucepan with 75ml water. Bring to the boil, reduce the heat to a simmer and cook gently for 5 minutes until the sultanas are plump and the water is absorbed. Tip into a food processor. Cut the butter into small pieces and add too. Blend until smooth. Sift the flour into a bowl, tipping in any grain left in the sieve. Stir in the oatmeal, hazelnuts, sugar and remaining sultanas. Mix well then add the sultana purée and mix to a thick paste. Take dessert spoonfuls of the mixture and shape roughly into rounds. Place on the baking sheets and flatten slightly. Bake for 12 minutes until slightly risen. Transfer to a wire rack to cool. Serve them freshly baked and lightly dusted with icing sugar. For a spicy flavour, add 1 teaspoon of ground mixed spice or ginger, or ½ a teaspoon of ground cinnamon. Almonds or brazil nuts can be used instead of the hazelnuts.